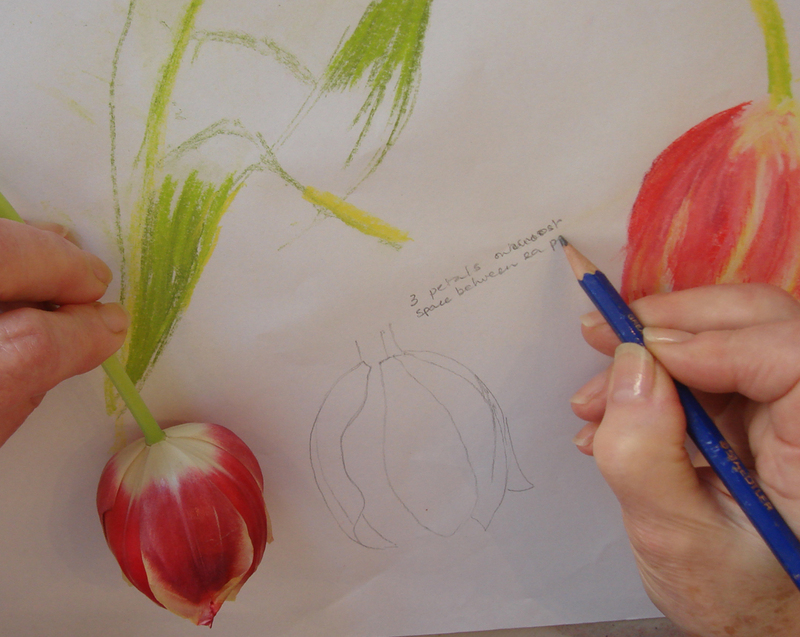 I have just given my first “Flower Drawing for Stitching” class at Heart Space Studios – to just 2 people – still early days for the new textile workshops but I have committed to teaching everyone, regardless of numbers, for the taster days, ie. 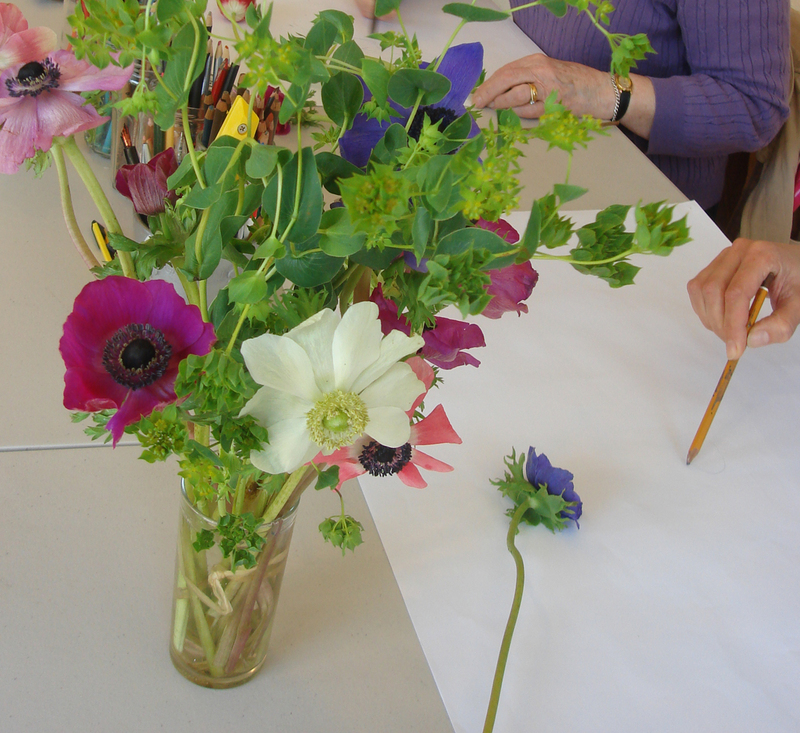 one day workshops to whet the appetite for the longer 6 and 10 week classes. 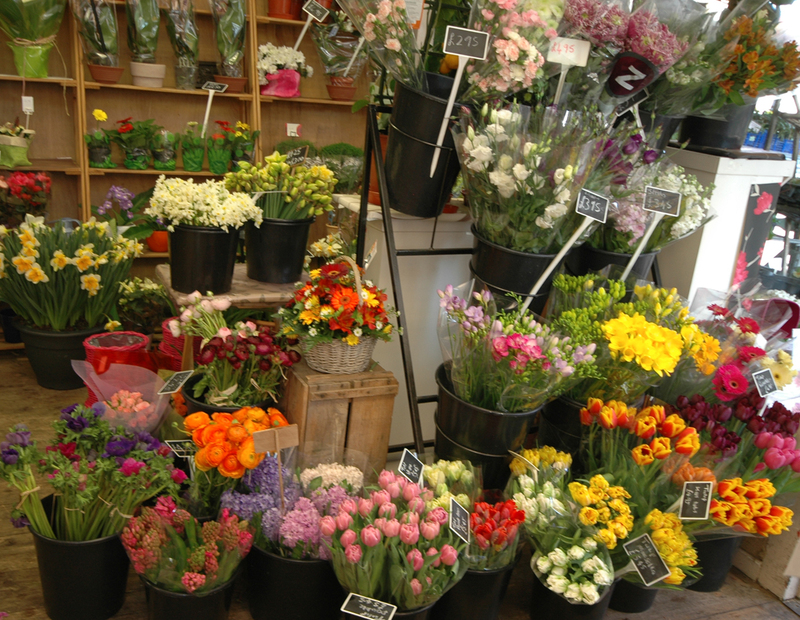 But the first thing I had to do was to go and buy the flowers – always a treat. 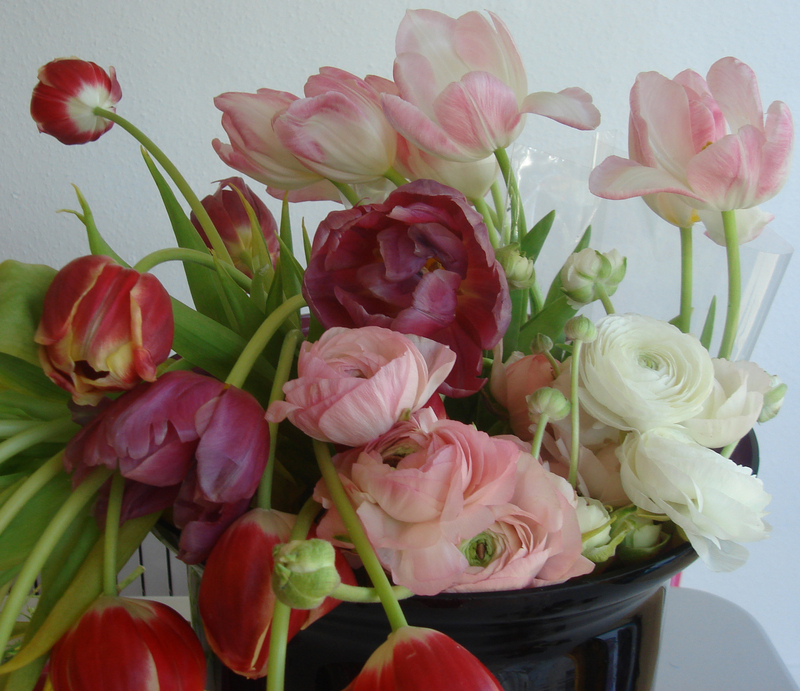 I asked the local florist, Barry Toogood, for some dying tulips and he didn’t look at all fazed but immediately went to the back of the shop and produced 2 lovely bunches of floppy stemmed tulips – for free. I also bought, ranunculas large pinks and whites, and a bunch of my favourite florists flowers ( on account that I cannot grow them myself) anemonies – in MIXED COLOURS – these are difficult to find now as the style police seem to have gained control over anemone growers so that they are often sold in bunches of one single colour – what a ludicrous thing to do – surely what everyone loves about anemonies – apart from the sooty black centres, the undulating stems and their ruff of brilliant green petals – is the wonderful mixture of glowing clashing colours; magenta, purple, crimson, palest mauve, softest pinks and whites suffused with lime and pistachio. 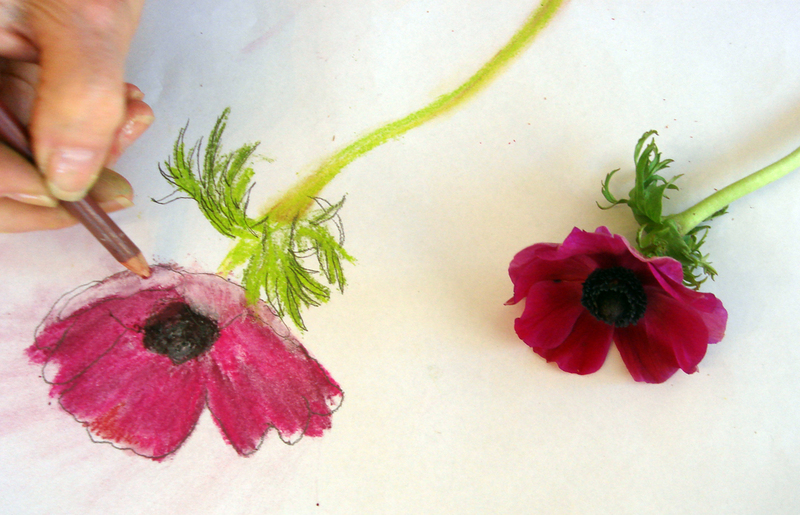 floppy tulips and mixed coloured anemones all ready to draw. 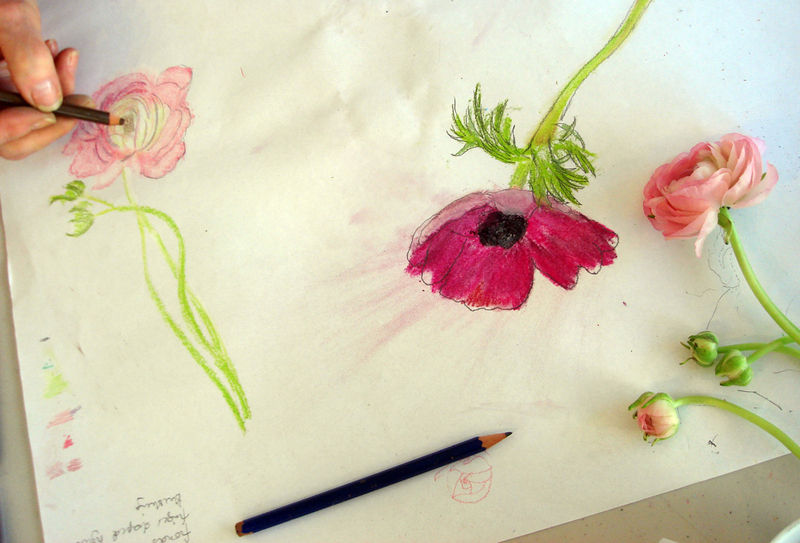 My two students had totally different attitudes to the flowers and the way they worked; but they both started off in exactly the same way when I asked them to choose one flower and just draw it for 10 minutes ( I always like to see just what people do when left alone, it tells me so much even though everyone is always very nervous when they start to draw in classes). 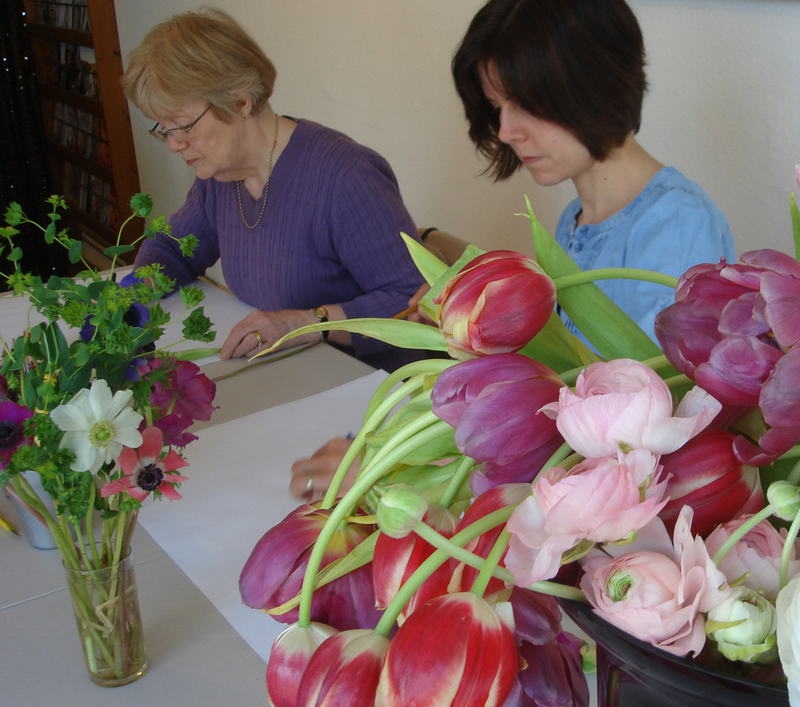 Occasionally, very occasionally, the colours are picked up first but I always start with the colours – I mean – what is your first response to most flowers, apart from scent which we aren’t dealing with here? So my first exercise in drawing classes is usually colour blocking then drawing outlines. I must admit they were both very diligent with my ‘strict mistress’ teaching style, and were soon developing lively studies to develop embroideries later. 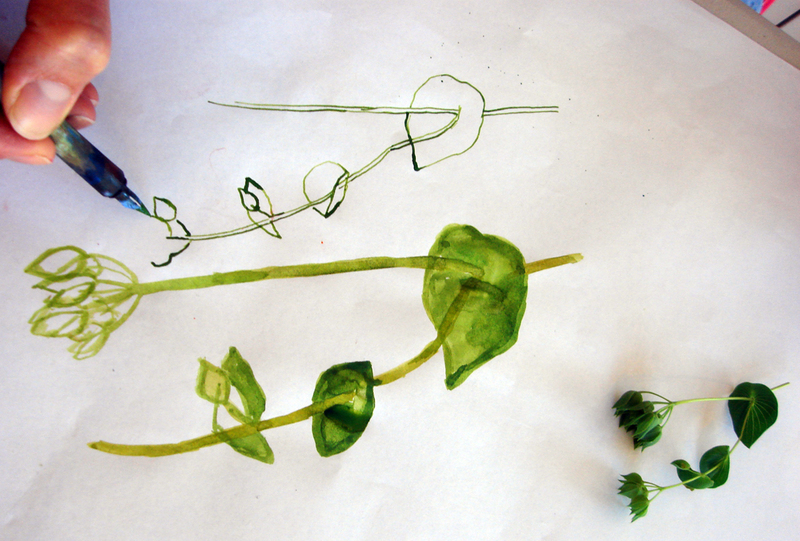 Choosing different media to suggest different surfaces also controls the scribbly or nervous “one of these lines must be correct” type of drawing. 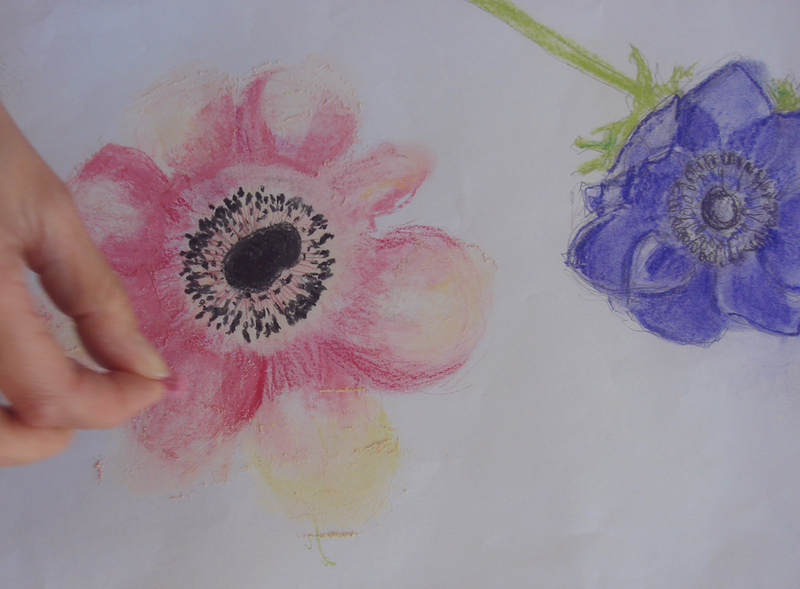 In the afternoon each student had to choose a drawing to stitch…and put the flowers away….this really tests the observational studies. 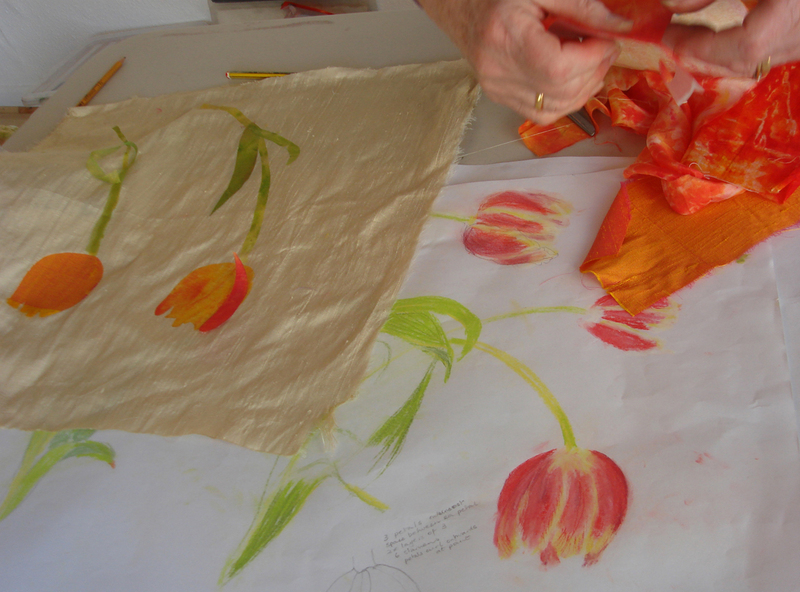 Ann White carefully made some line drawings and notes about petal sequences and the results of her studies carry her through to the applique stage where she was able to use her lovely marbled silk that she had brought with her from another course. I learnt a lot from this class myself, timing is essential if students are to achieve a decent piece of work in a day…it proved impossible to finish such an intensive set of research and sampling in the time, even though these students were experienced before they came to the class – so I need to adjust my way of working for the short classes but observational colurs and line drawing will always remain the starting point for flower embroidery. 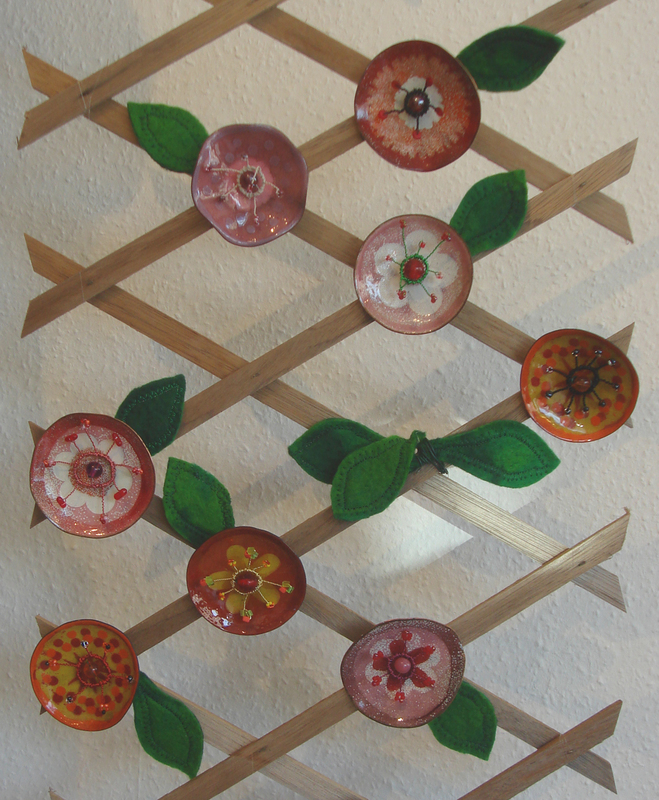 But one of the real joys of teaching in this new studio, is meeting like-minded people, and to prove this point Sue brought a piece of vitreous enamel flowers on a trellis that she had made at another series of classes in Bristol. I was so impressed and delighted and not a little envious of her work – as it seems much wittier than my own enamel flowers – that they now hang in the Heart Space Studios window. 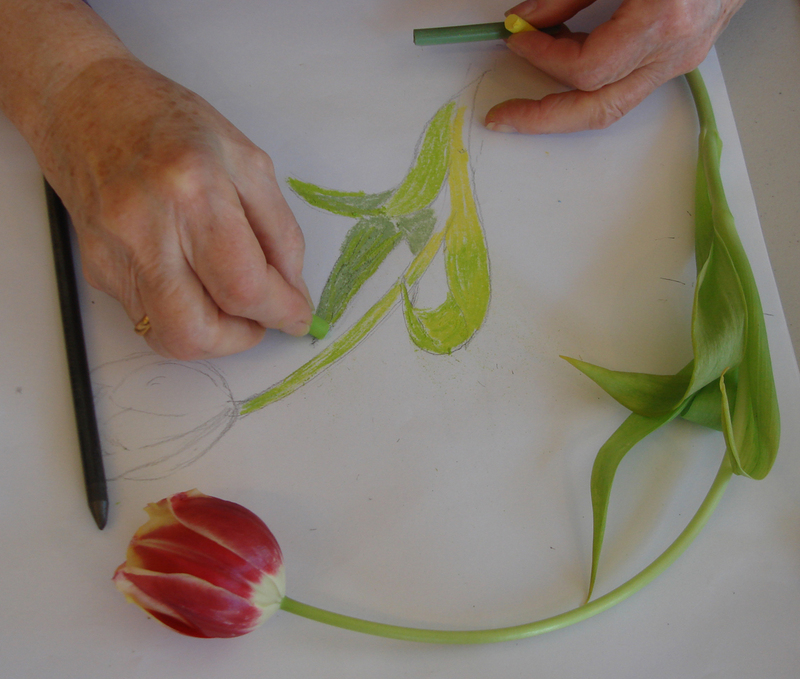 Categories: Drawing, Heart Space Studios, The Enamelled Garden | Permalink.